After an exciting two weeks of teaching on Maui last year in November, IXALT will be back THIS MONTH teaching at Living Way Church and the ShaktiRize Women's retreat on Maui in Wailuku. We are so excited and cant' wait to share our adventures with you. Stay tuned! Integrated Body Rhythm & Motion is a synthesis of dance movements deriving from Africa, the Caribbean, The Americas, and the Pacific. You will learn how to move to different sounds & music; hear and internalize rhythm; experience movements from other cultures in a non-traditional dance class; tap into your natural inner rhythm; and simply move your body with enhanced coordination and flexibility. Bring a towel, bottled water, and supportive foot wear. Wrap skirts (lappa or pare'u) are optional. 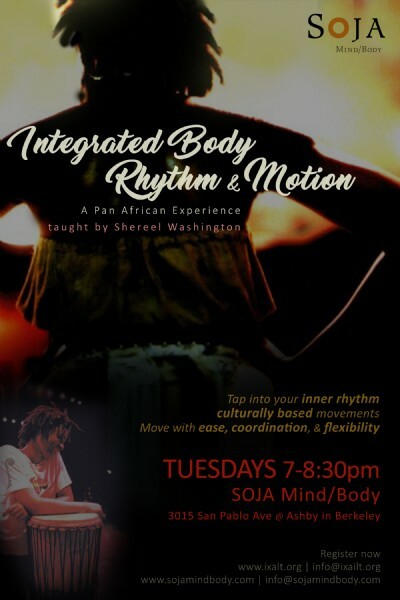 Integrated Body Rhythm & Movement is new dance class that will be taught by Shereel Washington on Saturday, March 11, 2017 3-4:30 pm at Soja Mind Body, 368 24th St, Oakland, CA 94612. First class FREE. Integrated Body Rhythm & Movement is a synthesis of movements deriving from Africa, The Caribbean, The America's and The Pacific. All levels and experiences are welcome. Bring a towel and bottled water. Wrap skirts (pare'u or lappa) are optional. IXALT featuring Joseph and Shereel will be sharing at High Street next Sunday. © 2007 - 2019 IXALT - All Rights Reserved.